These tasty and nutritionus James Wellbeloved Minijacks are 100% natural and made with fish, lamb and poultry to tempt your small breed adult dog. Whether you use them as treats or training aids, you'll have your dog's full attention when you whip a packet of Minijacks out. These delicious snacks are ideal for smaller breeds, like Chihuahuas or Yorkshire terriers. To make them, James Wellbeloved leaves out rich ingredients that little stomachs can find hard to digest. Each bite is high in protein – ideal for topping up your pet's energy levels during training time. Reward your dog immediately after they follow your commands to reinforce good behaviour. Follow the advice on the back of the pack for feeding guidelines. To keep your pet's diet balanced, reduce the size of their usual meals by around 10% to compensate for these little extras. These snacks are suitable for pets age six months and older. 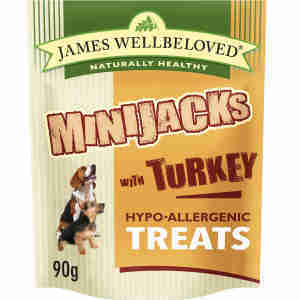 To make James Wellbeloved Minijacks just right for small dogs, stomach-friendly lamb, fish and poultry go into the mix along with rice and herbs for flavour and high-quality carbohydrate for an energy boost. These treats are hypoallergenic and free from wheat, dairy and soya, which are often causes of allergies and which some dogs find difficult to digest. James Wellbeloved adds natural vitamins, minerals and antioxidants to boost your pet’s immune system. If you have concerns about your pet's eating habits or think they may be having trouble digesting their food, speak to your vet for advice. They may also have some handy training tips. Duck Ingredients: Rice, duck, duck fat, tomato, potato, potato protein, mixed herbs. Contains: Minimum 55% rice, minimum 20% duck, minimum 10% tomato. Turkey Ingredients: Rice, turkey, turkey fat, tomato, potato, potato protein, mixed herbs. Contains: Minimum 55% rice, minimum 20% turkey, minimum 10% tomato. Perfect service thank you again..Great speedy delivery..The treats are great for dogs like mine with sensitive tummies, they’re the only ones she can eat and she loves them.. Perfect service thank you again..Great speedy delivery..
My dogs go mad for them! They have them as a treat when I go out, and to settle to bed at night, when I go to the tin, I have their undivided attention! I have a 2 year old Staffy with a very sensitive tummy. She loves these treats and so does her tum so everyone's a winner!